Please expand on the use of rooibos herbally in cooking – I love this stuff and drink it all the time. I used to put a tablespoon of rooibos in a bolognaise, hoping to capitalise on it’s “smoky” edge. It is quite a subtle taste so can be drowned out by other things or go a bit tanniny if overcooked – but I think it added a certain something. Apart from that I have done a couple of experiments cooking rice with it, taking the idea from “tea rice”. That works fine but I think I’d like to experiment a bit more. I have yet to try baking a “tea brack” with rooibos but I think that will be worth a try. I’ll let you know if I hit on anything amazing. Wow. An impressive and worthy ambition. I look forward to hearing how you get on. As a bread maker I noted the absence of yeast from your list. 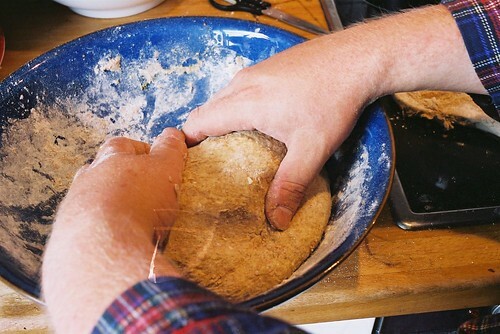 Have you mastered the art of sourdough or was it an accidental omission? I have a couple of sachets of yeast left in stock but the long-term plan is, indeed, sourdough! I used to keep a batch of rye sourdough on the go in my utility room until it began to harbour something bright orange and that was the end of it. I plan to have another go, though. You’ll know better than I that before the days when you could buy dried yeast at the supermarket, people were reliant on keeping a batch on the go or sharing it around. And, let’s be honest, sourdough tastes better too! Wow – I’m surprised about Tescos! You’ve pretty much described my diet, with the exception that I eat fruit and loads of greens. Also, I don’t eat oil or fat foods. Remember your greens, they contribute vastly to good health. I’ve made sour dough, it’s rather nice, although it takes the best part of a week to make! It’s the fat in normal bread that makes people pile on the weight, so sour dough is so much better for you. Whole grain rice or brown rice is much better than refined white rice. Tesco’s own brand is very cheap. Agave Nectar is not good for you! Honey is better, blended dates are better still. If you keep off the added fat foods, like oil and nuts, then I guarantee you will loose excess poundage! The low fat, whole food plant based vegan diet is just about the cheapest and one of the healthiest ways to eat. I’d love to hear how you get on. I appreciate the advice, too. I’d like to experiment with ground dates, though.Can I just stick some dried dates in the processor? When buying dates, or any other dried fruit, try and make sure that they have no preservatives in them. As long as you make absolutely sure that the dates are de-stoned, then you can blend them. They blend easier if pre-soaked. If you have a high powered blender (1kW+), they’ll blend ok anyway. Be careful though, if you throw a handful of dates into a blender running at high speed you can brake it. I snapped the output shaft of mine doing just that. To blend unsoaked dates, add some water into a blender, switch on, then add dates slowly one by one, of even half by half. This is purely to protect your blender! They are expensive, but as a treat you can make smoothies with dates in. I’ll often blend bananas and dates, or oranges and dates. Some people make dateorade by blending loads of dates and water. One of my favourite date recipes is banana and date ‘ice cream’. I make this by putting frozen bananas through my masticating juicer together with de-stoned dates. Out comes the most amazing banana and date ‘ice cream’ that is much better than just about any ice cream. Not only that, the banana and date ‘ice cream’ is actually good for you! The raw fruit based low fat vegan diet is very expensive, but worth it if you can afford it. The complex carbohydrate based low fat vegan diet is just about the cheapest diet going, yet is much better for you than almost any other diet – with the exception of the raw low fat vegan diet! Seems like I’m on the right track.